Grace College student Madi Brill, left, and 2018 Grace College graduate Jenna Reinhard will participate in Smart Tech next month in Indianapolis. 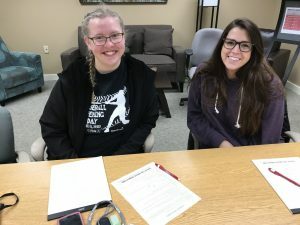 Two Grace College students are soon headed to Indianapolis to participate in Smart Tech, an immersive, four-week program to prepare liberal arts students for the high-tech job market. Jenna Reinhard, a Bluffton, Ind., native who graduated this month with an intercultural studies degree, and Madi Brill, a rising junior from Hudsonville, Mich., majoring in interdisciplinary studies, were selected from Grace College, Winona Lake, Ind. Students are chosen by recommendation of their universities for their academic record and technical savvy and then approved by the Smart Tech board. DeeAnna Muraski, associate director of the Center for Career Connections at Grace College, led the selection process at Grace. “Madi and Jenna are both bright students who will contribute and benefit from their experience at Smart Tech. I’m glad they are willing to take on this challenge and improve themselves for the high-tech job market,” Muraski said. Brill was thinking about her summer plans the entire day before she received an email with the subject line “Summer Opportunity” from Muraski. “I knew it was from God,” Brill said. “There was a little bit of anxiety, but I was prepared to accept it immediately.” As a future librarian, Brill believes the technical skills she learns will be invaluable because libraries are increasingly immersed in technology. “I’m ready to just dive in and learn,” she said.